JVS design and manufactures adapter spool (cross over spool) in various sizes and pressure ratings. Adapter spools may be single piece forged or welded construction. Adapter spool have end connections of different sizes, pressure ratings and/or designs. 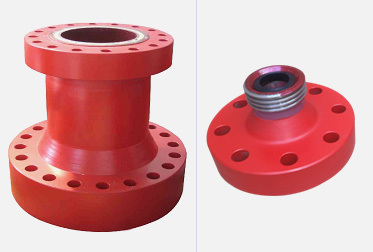 Adapter spool is designed to avoid the bolt fit up fouling and to allow connection of different drilling equipment. Each spool is pressure tested and drift tested prior to dispatch. The rated working pressure of the adapter spool will be the lowest rating out of both end connections. Hammer union adapter spool can be either male or female hammer union. Customer should specify the length / height according to the rig requirements. (AISI 316L or Nickel alloy 625) enhance the corrosion resistance ability of ring groove, thus enhance the product life. Lifting pad-eye or lifting lug is well capable of handling the weight of the spool. Spools are either single piece forged or welded construction, which depends on criticality and customer requirement. When "minimum height or length" is specified, JVS adapter spools have corresponding appropriate height (or length) with adequate clearance to accommodate studs, nuts, wrenches, and clamps as applicable.